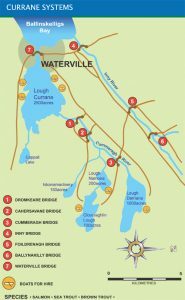 Waterville's Lough Currane is renowned worldwide for the quality of it's Salmon and Sea trout fishing. Lough Currane a small distance to the rear of The Crescent, has a beautiful backdrop of mountains and spruce forests. Big spring Salmon and vast numbers of Sea Trout have to run only a 500 yard length of the river to reach the waters of the lough. Fly fishing is the norm with some trolling for early season sport are carried out on the lough. Your Gillie will provide a great day's fishing experience. From setting your rods up, holding the boat close to underwater rocks, islands and headlands, while anglers fly fish, to the all important 'Brew'. It always tastes special made with lough water. The main Spring salmon run is from January to May. Average weight 10lbs. Your gillie will supply any rods you may require. Rods from a 12ft to 15ft. double handed are recommended. Popular fly patterns are Hairy Mary, Thunder and lightening, Munro Killer, Black Doctor, Blue Charm, in sizes 6,8 and 10. The main grilse run from May to September. Average weight is 5lbs, and lighter tackle than that used for the Spring is recommended. The Crescent can book a Gillie for you matching your level of experience with the Gillie. Early booking is necessary as the Gillies are quickly booked out quickly. A packed lunch can be prepared for your day's fishing, just let us know the evening before so any special dietry needs can be met. The sea trout fishing begins in Mid-May. Average weight 2-2 ½ lbs. From July onwards Finnock(known locally as 'juniors')can also be caught. Average weight 1-1 ½ lbs. A single handed 10ft-11ft rod is recommended and popular patterns are Bibio, Black Pennell, Claret Bumble, Connemara Black, Fiery Brown and Watson's Fancy in sizes 8,10,12, and 14. A river in the Waterville catchment area are generally spate (flood) rivers so fishing is best arranged during the holiday and according to conditions at the time. The catchment is a long narrow mountain valley of some 47 square miles, the fishing which can be excellent is usually confined to about 8 hours following a spate. As the Inny River has been set as a Brown Tag River for 2017, there is a total allowable catch by rod and line of 30 salmon or sea trout (over 40cm) for 2017. Due to the low amount of Brown Tags available to anglers, it has been decided that they will be distributed via a lottery system at four different dates throughout the season. The lottery will be held at the Inny Bridge on the Waterville / Cahersiveen road at 18:00 (6pm). Time and venue may change depending on weather but anyone who has submitted details to the authorized distributor will be notified beforehand. Tags will not be distributed before March 1st in order to allow anglers to purchase their licences and submit their licence number to the authorized distributor. Any angler wishing to fish the Inny during this period will have to do so using Catch and Release methods only. A valid National or Kerry licence number for 2017 must be submitted with name, address and contact number to the authorized distributor only, up to 2 days before each lottery. In order to ensure that the tags are distributed as evenly as possible, if an angler receives a tag in any of the draws, whether or not they use it throughout the season, they cannot enter any of the 'remaining draws. If an angler decides to finish their season early, we would encourage them to return the tag to the authorized distributor so as it can be put back into the pool of tags for the next draw. Anglers may not use worms. Anglers must use single, barbless hooks at all times. Brown tags cannot be transferred between licence holders without contacting the authorized distributor before the tag has been transferred. The main Spring salmon run is from January to May. Average weight 10lbs. A 12ft to 15ft. double handed fly rod is recommended. Popular patterns are Hairy Mary, Thunder and lightening, Munro Killer, Black Doctor, Blue Charm, in sizes 6,8 and 10. The main grilse run from May to September. Average weight is 5lbs, and lighter tackle than that used for the Spring is recommended.